When it comes to Passover desserts, I believe that less is more. I make chocolate covered strawberries every year, and a batch of matzah “crack”. A good fruit salad goes a long way, too. And then there is this refreshing, delicious Strawberry Lemon Sorbet. It’s sweet, but not overwhelmingly so. (And you can play with the sugar in the recipe to reduce it if you want.) Kids and adults, alike, will love it. 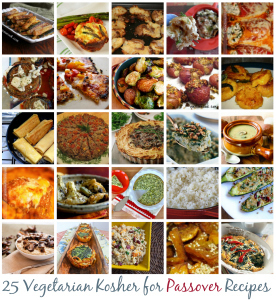 It’s the perfect ending to any Passover meal — even your seder! Heat sugar and water in a sauce pan over medium heat until the sugar is fully dissolved. Remove from heat and add fresh lemon juice. Pour mixture into 9×11 pan (or freezer-safe dish of your choice), cover with plastic wrap and freeze for at least five hours. If you want your sorbet to have a creamier texture rather than an “icy” one, you need to r-eblend it after it’s already frozen. (Just chop everything up and throw it into the blender.) Poor it back into the pan and refreeze again. Use an ice cream scoop to serve. Word to the wise: Keep your hand on top of the blender at all times. Or you’ll have a sticky mess all over your counters. What’s your favorite Pesach dessert? This sounds awesome, Mara. Would it work with bottled lemon juice? Would you adjust the quantities at all? I didn’t make them up and I didn’t make them for the seder, but they were so good I have to share! My younger son’s 5th birthday was yesterday (both of my boys are Pesach babies!) and I made the brownie recipe from Passover by Design for his birthday “cake”. Can you say CRAZY good???? They are so fudgy- I couldn’t believe that they were KLP (they also happen to be gluten free)! I made these: http://smittenkitchen.com/2012/03/raspberry-coconut-macaroons/ which I dipped in bittersweet chocolate. They were very good. I also made a batch without raspberries that I dipped in milk chocolate that were a huge hit. They were also ridiculously easy, I think our days of canned macaroons are over. We finally learned the secret of sorbet this Pesach. After the first freezing take the pan out of the freezer and let it defrost slightly, just enough so that you can cut it. Cut it into chunks and run it through your food processor (or blender) again. Then freeze until ready to serve. That’s how you get the creamy sorbet texture. Enjoy! Like ariellla said, to get the right texture on sorbet, u have to freeze-defrost-put thru blender again, at least 2 or 3 times. The more u do it,the better it is! I am so excited to make this sorbet – I bought a blender for Pesach years ago and have only used it once! Just made mine, Barbie! Yum. Hope yours turns out great as well! I had a lot of problems with this recipe – I am sure that they were all a result of me a) doubling the recipe and b) perhaps different cultural definitions of the word ‘blender’. In any case, I wanted to add my feedback so that other people don’t also end up with Sticky work surface and floor. Luckily I hadn’t already washed it! DON’T blend everything together! Blend the strawberries ON THEIR OWN, then add to the sugar/water/lemon mixture, which you can mix by hand. I suppose I should wait to see how the sorbet turns out before I post, but I am optimistic. And I need to washer the floor now. Happy Passover! Sorry you had issues with it. I blended the strawberries right in with my liquid, but I definitely had to keep hand on the top. With 8 cups of water, I can see how you’d run out of room in the blender. Be sure to do the second blend/puree trick some readers above suggested. It really works! Place in blender or food processor and process. This will make a square pan of really creamy sorbet. sometimes I will make 3 flavors and then layer them so I get three pans. I love to serve this after a Yom Tov meal because it is so refreshing. I used season fruits, cantelope, honey dew and lime for example. Good question. I make this for probably 10-12 people. Maybe a bit more?